Hope Floats Equestrian is a quality full care horse boarding, training and lesson stable located in the beautiful rolling hills of rural Carroll County in Taneytown, Maryland. 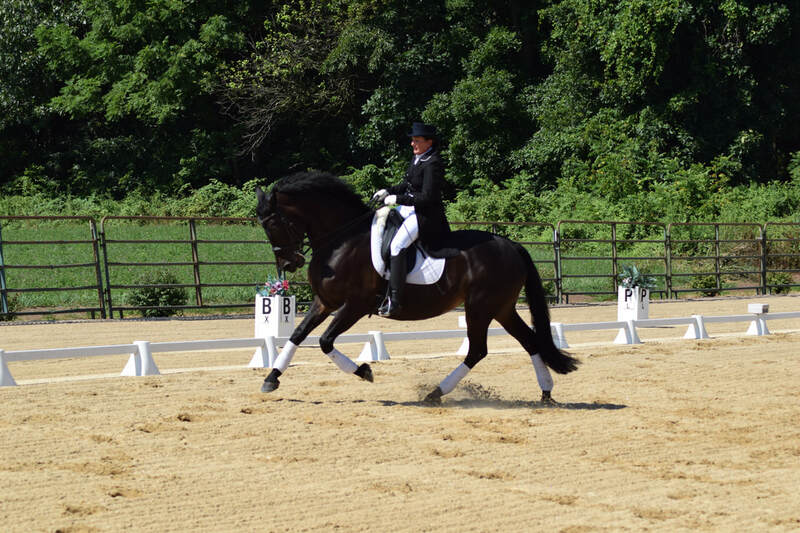 We are committed to providing correct training and instruction in Classical Dressage. Our stable's primary focus is on the training and education of adult riders and their mounts who are serious about improving their riding skills, either for competition or just the enjoyment of knowing their horses have had correct training. Our ultimate goal we strive for is to bring each horse and their rider together in harmony and partnership, instilling in each rider a deeper level of communication, knowledge and responsibility; all which are key elements to a successful team. Please email for current stall availibilty. jholtsberg@hopefloatsequestrian.com for more info. "A Midnight's Summer Dream" and I are proud to announce that we have met all the required scores and are now USDF Bronze Medalist. What a journey it has been and now we press on towards the USDF Silver. "Working towards the USDF Silver! " “Top notch facility. This place is all about the horses. It’s worth the hour drive, I only wish there were more people who cared like this farm owner does. Very impressed and feel good about boarding at this beautiful place. The horses are spoiled, the stalls are huge. I look forward to the weekends! "I have boarded for 3 1/2 years at Hope Floats Equestrian and plan on being there forever. I have found a home for my 2 horses ( Friesian and Percheron) that consistently gives excellent care no matter the needs. Jeanine Holtsberg is a knowledgeable, caring and consistent manager with an attention to every detail. She personally is invested in my horse’s health. She has also been the trainer for my 16 yo daughter and has brought them together to be a safe and successful team. With her knowledge and positive training she has helped my daughter to take a barrel racer into a dressage horse winning a high score award for the PVDA with her first year showing dressage! I look forward to continued training with her for myself and my daughter. She constantly has something new to teach and encourage you in your equestrian journey." "Best Boarding Facility **FULL CARE & REHABILITATION - I called in need, and it was instant. Very Clean and Upscale care - IMPECCABLE - truly can not say enough except I wish there were more like this. Will use her again in a heart beat IF there is a stall available."